Last night, I finished assembling the waterblock for the new server in my basement. Since I'm new to this watercooling stuff, I decided that a design where the fluid path through the server has no potentially leaky fittings along it would be a good starting place. I made the waterblock from two chunks of 6061 aluminum, with a loop of copper tube sandwiched in the middle. I milled a semi-cylindrical groove in each plate of aluminum with a ball-end mill, and added relief on one side to allow space for a 180 bend in the tube. The plates are clamped together with 1/4-20 socket head cap screws. As I tightened the bolts, I could see the gaps around the tubes disappear, so thermal contact between the tube and the plates is at least decent. Unfortunately, the upper plate doesn't make good contact with the lower one. By design, there's a nominal 0.010 in gap between the two plates before the tubes are compressed. I tried adding shim stock between the two, but I couldn't easily balance the contact force between the tubes and the plates, so I left out the shims. 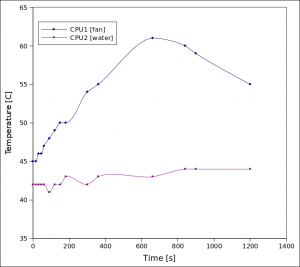 I fired up the server, and it looks like watercooling is a lot more effective than I expected. 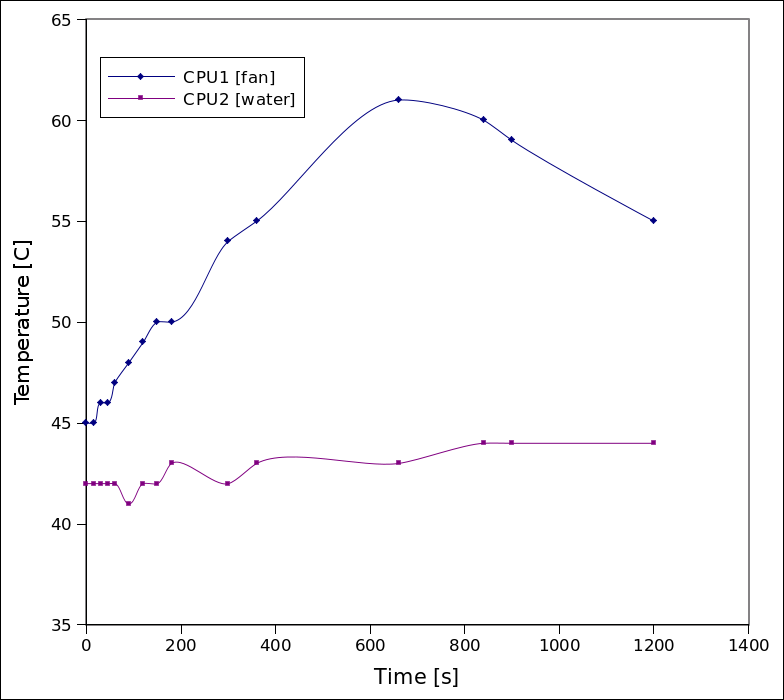 The blue line is for the CPU that was air-cooled, and the purple line is for the watercooler. The blue line dives after 10 minutes or so because that's when I realized one of the fans aimed at CPU1 had stopped. If the fans all worked, I bet the watercooler would still win on absolute temperature, but the fans might win on efficiency. The circulation pump, a Laing SM-909-NT-14 designed for hot tubs, I think, is rated for either 15 or 65 W, depending on which part of the label you believe. (I'll have to measure it to find out for sure.) It maxes out at a volumetric flow rate of 8 L/min, but with the small diameter copper tube attached, it drops to 2.4 L/min (40 cm3/s). The ID of the tube is 0.48 cm, which puts the mean velocity at 2.25 m/s. The Reynolds number for this flow is around 1000, which is below the transition to turbulent flow, which occurs around 2300. Looking at the jet coming out the end of the tube, it looks laminar. You'll notice that the tube is wearing a beautiful brass fitting. This is a fitting that I clamped on during the bending process to keep the tube from sliding into the pipe bender and crimping, rather than bending in a nice radius. Unfortunately, I failed to realize that the section of tube with the fitting would be trapped between bends. So, I call this a success. The next iteration of the waterblock will be made from copper, and I'm hoping to make two of them so I can actually run the server. I thought about trying to press tubes through reamed holes in a block, maybe with the help of a heater to expand the block, but I think I'll try a two-piece soldered design instead. My plan is to create a vaned cavity that guides a sheet of fluid across the processor, but I haven't figured out the details yet. Onward! The EPA regulates woodstove emissions in the US. Each year, they publish a list of the roughly 700 types of woodstoves sold in the US that includes an emissions metric (grams of particulate per hour) and a range of output power (BTU/h) for each stove. For reasons that I may never understand, the EPA releases this data as a PDF. By the way, as a quick summary of the data: if you want a clean stove, buy one from Vermont Castings. They make 6 of the 10 cleanest stoves, 5 of which emit less than 1 g/h of particulates. For comparison, fireplaces produce around 30-60 g/h. I should also say that particulate emissions are not the only emissions to think about with a woodstove. According to the Energy Information Administration and Google's sweet unit conversion feature, wood releases around 85 g of CO2 per MJ of heat. That's better than coal, which is up around 90-100 g/MJ, but worse than natural gas, at 50 g/MJ. Electric heat is the worst, at 125 g/MJ, assuming the electricity is coming from a ~40% efficient natural gas power plant like the Exelon Power plant in Everett that supplies Somerville's peak loads. Of course, you have to heat your house somehow (or move to the tropics). Trees will grow back soon, while coal and natural gas take a little longer. My brother and his wife bought a house in Michigan a few months ago, and Sharon and I went out to visit them last weekend. The house is on a wooded lot a few miles outside of town. There are other houses that you can make out through the woods, but nobody really nearby. They probably own an acre or two of woods, and they abut a 15 acre park (which previously housed a privately-owned 1/3 scale steam railroad-- I'll save that for a later post). At some point, we were standing around in the yard when Ben pointed out an overgrown field about 30 yards through the woods. Ben had previously discovered steel posts that suggest the field was in fact a grass tennis court that hadn't been maintained for at least a decade. As soon as I saw the outline of the tennis court, I thought, "These weeds will be subdued by this man. I will burn fossil fuels in an age-old ritual: the subjugation of the wild to man's will." A few days later, I dragged Ben's 6.5 horsepower beast of a lawnmower out of the shed and fired it up. 30 minutes later, nothing taller than three inches lived within the perimeter of the court. Once the tennis court was recovered, the landscape was changed. Instead of a house in the woods, we had in our possession a house overlooking a small athletic field. There was talk of a croquet pitch or maybe a small soccer or frisbee game. I mowed the rest of the field, and we thought about the possibilities. Later in the day, we talked about maybe putting a zipline in the yard on the other side of the house, but it didn't really seem like the right spot. The lawn was something of a valley; I didn't see an easy way to position the zipline so the rider wouldn't crash into the tree at the bottom. As it was getting dark, I walked around the yard and considered the possibilities. Coming around the corner to the tennis court, I noticed that the court was a good ten feet lower than the house, and there was a nice tree right at the edge of the yard. Ben pointed out that there was a massive tree on the far side of the tennis court. I paced the distance off at around 150 feet. As I was lying in bed that night, I did some calculations in my head. The potential energy of a person at the top of the hill would be converted into kinetic energy at the bottom of the hill. If we ignore wind resistance and friction in the pulleys, we can estimate an upper limit of the speed. I went to sleep thinking that a zipline where you landed at a 25 ft/s sprint was about as dangerous as I wanted. The pipe-trolley forcing alignment with the cable worked well; I think a trapeze mounted at a single point would make it harder to launch and land safely. After a few runs, I noticed that the axles in the pulleys were too hot to touch, due to the friction from the nylon sheaves. That was mitigated with a few squirts of Boeshield T-9, everyone's favorite waxy lubricant. In the future, if the zipline proves popular, we might raise the start a foot or two and switch to a Petzl "Tandem Speed" pulley, which has ball bearings instead of a nylon sheave riding on a fixed axle. There's also talk of adding a slip-n-slide in the landing zone. I knew that the zipline was a success when my brother's wife went out and rode it three times in a row by herself the next morning. Videos and more photos below. I was invited to speak at Olin College a few months back as part of a seminar series about sustainability and engineering. The talk was indirectly inspired by my previous post on the topic. (By the way, Olin is great. If I were going to engineering school now, I'd definitely apply to Olin.) The folks at Olin recorded the talk, and after some manipulations with mpgtx, it's now up on Youtube. Most importantly: answer the right question. If the question is, "How can I use our current energy infrastructure to propel myself in a 4000 pound steel cage?" the right answer is, "Build a hybrid SUV." If the question is, "How can I kill more efficiently?" the right answer is, "Make robots kill on my behalf." These are the wrong questions. Right now, the crucial questions we need to answer involve balancing our desire for the fruits of energy consumption against global heat death. Differential equations: learn to solve them by computer. Learn when to distrust that computer. If a class is boring, it's because it's taught poorly. There are no college classes in boring subjects. Go broad first. Going deep is fine if you have the passion, but as an investment, it's unlikely to pay off. Thanks to Matt Ritter, Elsa, and the rest of the Olin folks who helped with the video taping and mucking around with the video files. For the last few months, I've been thinking that a drain heat recovery system might be worth installing in our basement. The idea is that while you take a shower, you run the cold water refilling your water heater through a copper coil wrapped around the hot water going down the drain. There's a nice diagram on the EERE site. (Unfortunately, the EERE site also estimates the payback time at 2.5-7 years, which I think is bunk.) This kind of system doesn't work to recover energy when the draining and refilling doesn't happen at the same time, as with a dishwasher-- when the dishwasher releases the hot water, your water heater has long since refilled (or your on-demand system has turned off). In April, I measured the ground water temperature in Somerville at 7 C (45 F); I suspect that's close to the annual mean ground water temperature. I also measured a hot shower at 38 C (100 F). This is a little conservative-- I think Sharon usually likes something more like 40 C, but let's say that on average we require water to be heated at least 30 C above the ground water temperature. The heat capacity of water is 4.2 J/(mL * C), so with a 30 C difference, we're losing around 126 J for each mL poured down the drain. I measured the flow rate of our shower at 2 L in 20 s, which is 100 mL/s. This means we're using 12,600 J/s, or 12.6 kW. A ten minute shower uses 600 * 12,600 J = 7.5 MJ, or 2 kWh. Drain heat recovery system vendors claim that they can recover almost half of the energy available to the heat exchanger. If we optimistically say we'll always get 50% of the energy back for the next shower, that would be about 1 kWh per shower, or 2 kWh per day, since we each shower every day. Natural gas for our water heater is currently $1.55/therm or $0.053/kWh, so that would save us $0.10/day, or $0.20/day if we assume our water heater has an efficiency of around 50%, which is typical of the crappy gas models like the one in our basement. At the flow rate I mention above, I'd need a heat exchanger about 40 inches long to hit 50% recovery, which would cost around $600 plus installation. If that totals around $1000, the payback time is 5000 days, or at least 13 years, even with the optimistic assumptions I've made above. Unfortunately, even if the system lasted 13 years without corroding, the chances of us living in the same house until then is small enough that I think I'll hold on to my $1000, or put the same money toward a more efficient water heater. On the other hand, it does suggest that a doubling in the cost of natural gas plus self-installation would make it a win. If you own a drain that handles more than ~4 showers per day in the Northeast (like in gyms or apartment buildings), you'd have to be an idiot not to install one.